The main roles of performance scientist are to help athletes and coaches to optimize their performance via the application of a multidisciplinary sports science and technology (equipment). This includes applied physiology, biomechanics, biochemistry, psychology, and motor control, among others. In short, a performance scientist is an expert in sports science and sports performance. This may be different from the high-performance manager that is usually tasked to manage and oversee the high-performance program and development for a particular or a group of sports. Both performance scientist and the high-performance manager is seen synonymous due to the mixed roles that one may have to do. For example, in some institutions, the same person, e.g. head of sports, may have to do both. Regardless of the above, athletes require the best support from the different area of sports performance (training, monitoring, management, etc.) in order to maximize their performance. This is where a performance scientist can play a major role to support this contention. In major competition, we have observed athletes who ... unable to get out of blocks smoothly, cannot accelerate properly, fails to maintain good technique throughout competition, lacking of speed endurance and dies towards the end, not being explosive and powerful enough, no physical capacity compete with others, lost by one hundred of a second to an opponent in major games and missing the gold medal, multiple mistakes, obvious difference in body composition, movements that are not coordinated, injury, and so on. A performance scientist can play a huge role here. But how? First, a performance scientist will look into aspects that can be optimized, modified, or addressed. Thus, all the available information will be used to determine "what needs to be done." This can be achieved through a series of physical, physiological, psychological, and biomechanical assessments – body composition, strength, power, speed endurance, stride length, and frequency, etc, or assessments of performance during a competition. 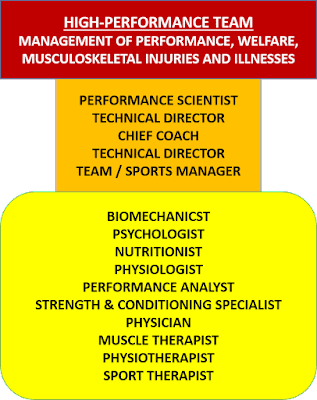 This is usually done by a high-performance team (of sports scientists) led by the performance scientist, which involves strength and conditioning specialist, physiologist, biomechanist, nutritionist, psychologist, physiotherapist, physician, etc. in conjunction with the coaching staff, technical director, and manager (see Figure). Information from these experts or scientists can help a performance scientist to develop a more objective and "well supported" work plan. A group of scientist and medical personnel will then work in parallel based on the work plan that has been developed earlier. This integrative way of working with athletes can provide a better understanding of performance, more objective, effective, transparent process in terms of working strategy, which can also eliminate intervention bias (e.g. typical question; does he needs more physical or mental training?). An integrated approach is different from the classical multidisciplinary methods, which involves experts of different sports science and medical areas who are working with one athlete at the same time, but they work according to what they feel would work for athletes purely from the perspective of their own field. 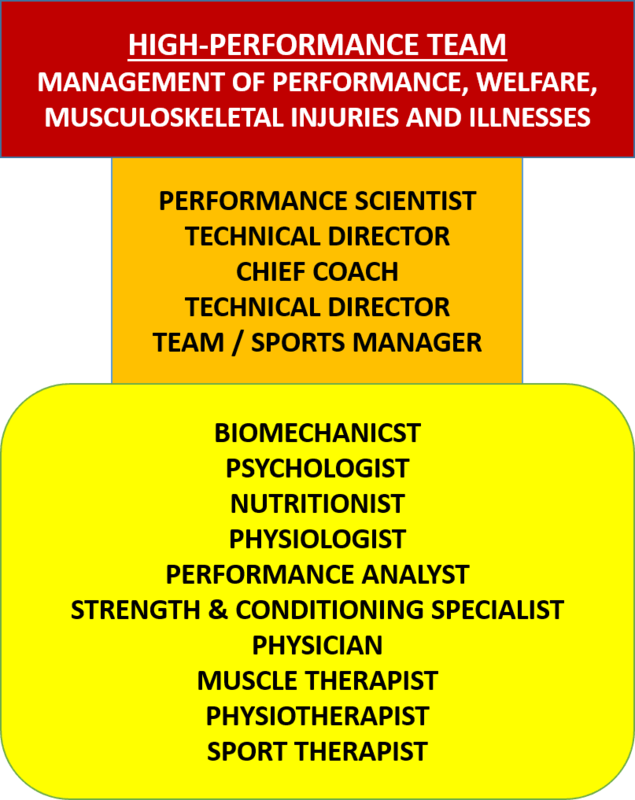 Note that in this Figure, performance scientist (who is an expert in sports science and performance) is grouped together with technical coach (as well as chief coach and technical director) who is expert in sports-specific performance, and also sports/team manager who involve in the management aspect of athletes. The work plan is used to guide the intervention process using an integrated approach. This includes, for examples, what to do in terms of strength training (by strength and conditioning specialist, and how a nutritionist can support this intervention), what exercises to choose for specific muscle strengthening (by strength and conditioning specialist, and how a biomechanist can provide insight on athlete's gait and motor coordination/technique), and how a group of three scientists (of different expertise) works together to provide a training recommendation as a result of their physiological (strength and power), biomechanical (i.e. kinetic and kinematic), and motor coordination assessments (i.e. technique). Further, this is extended to ... a) how a biomechanist and skill acquisition expert can work together to improve an athlete's skills ... b) how a psychologist can incorporate a mental rehearsal skill to help improve motor coordination and behavioral performance (i.e. motor control) ...c) how athletes can benefit from a combination of tactical insights (i.e. by performance analyst) and skills to deal with pressure (i.e. by a psychologist) to improve on decision making and strategy/tactical. During a competition (e.g. sprinting start), experts will observe and assess athletes to provide related information such as changes in the angular displacement of joints, motor coordination or technical accuracy, as well as the behavioral aspects (e.g. anxiety and emotional); and how this information is used for intervention by both strength and conditioning specialist and technical coach; and monitored over time by the aforesaid sports scientists to see if athletes have improved. Having said that, successful athletes rely not upon only good support. Before we even think about high-performance support, the biggest gains that athletes can have are actually from their discipline, motivation, training consistency, if being free injury, have access to proper recovery, have nutritious meals, and so on. Athletes must have a positive mindset and belief that would steer them to become better athletes, but we can't deny that a good coach can help to facilitate the process. A good practice environment (people and facility), proper management, good support services, sports science and medicine are essential in high-performance sports.